Computer aided DTV reception studies are great, but the computer cannot be programmed for electrical (AC) interference, generated by high voltage power lines, or RF interference, caused by mobile radios, harmonics of broadcast stations, vehicular traffic, etc. Nor can the computer predict the presence or absence of reflections (ghostings), a real HDTV picture quality killer. The professionally conducted on-site DTV reception verification testing will deliver conclusive test results, assisting the survey engineer in making proper antenna tower height and antenna-array recommendations. An ideal verification survey should use a 150’ high telescopic mast, a rotor-mounted 6’ diameter parabolic antenna on the top of the mast, conducting a full week on-site testing to experience inclement weather conditions, with hourly readings, 12 hours a day. Of course, this is just a dream. No company management would authorize such an expensive project. The Biro DTV reception verification survey uses a bucket truck, with rotor-mounted test antenna.. elevated to 35 ft above ground. 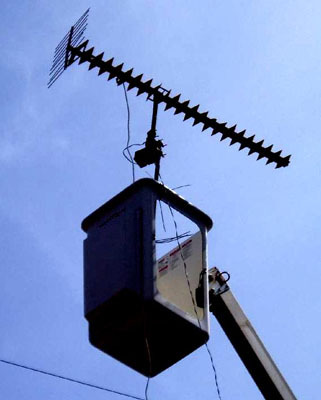 Separate antennas are employed for surveying UHF High-Band and low-band DTV stations. 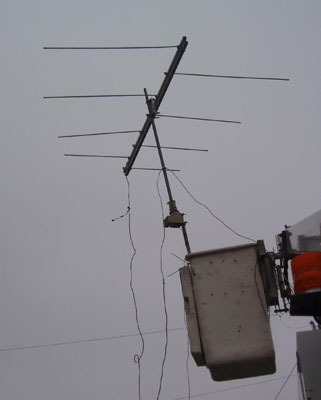 The most desirable time for conducting a DTV reception survey is at mid-day, particularly 1:00 to 3:00 PM, when the signal path from the distant UHF station may be broken by heat turbulence and ascending warm layers. This does not mean that surveys conducted on foggy or rainy days are of no value, but early afternoon hours represent the most favorable testing time under any conditions. Almost all distant UHF stations exhibit variable fades between 1:00 and 5:00 PM, with maximum depth of fade occurring around 3:00 PM. Rotor-mounted high-gain, high directivity antenna (Radio Shack antennas no need to apply), separate antennas for UHF and VHF stations. Low-loss coaxial cable, connecting the antenna with the instrumentation. Large screen LCD TV monitor. Computer Run and Signal Direction Sheets, to alert the survey engineer about low output power, low transmit antenna height stations and potential adjacent/co-channel interference difficulties. Co-channel and adjacent channel interference identification is highly desired objective of the on-site signal survey. The FCC sold off the top 100 MHz of the UHF band for 20 billion dollars, forcing Channel 52 to Channel 69 stations to relocate into the 470 to 700 MHz frequency range . When a lot of TV stations are squeezed into a limited frequency range, the trouble is just around the corner. The net result: increasing number of co-channel and adjacent channel interference conflicts. 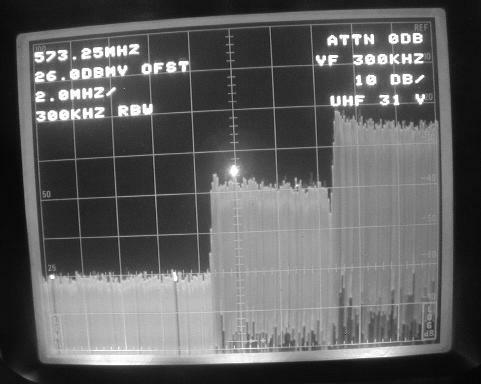 The photograph above shows a serious adjacent channel interference situation, The desired Channel 31 power spectrum, in the center of the screen, was found at a level 15 dB below the undesired adjacent Chanel 32. The carriage of Channel 31 DTV could not be recommended. When the undesired DTV station’s amplitude is 15 dB higher than the desired, there is no guarantee that even a phased-array will provide satisfactory protection. Let’s make it perfectly clear, an on-site DTV signal survey is not sponsored by the Ford Foundation. 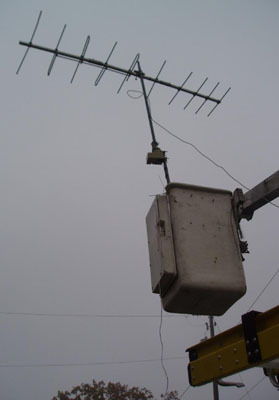 However, the cost benefits of the survey, such as an antenna tower shorter than recommended by the antenna manufacturer’s salesmen, or parabolic antennas providing simultaneous reception of co-located HDTV stations, could more than compensate for the costs of the verification survey. And last but not least, in the event of major problems with the proposed site, it is much better to discover the problems before signing a lease, making a costly deposit on the property or installing an unreasonably tall antenna tower.